Graceful and relaxing. 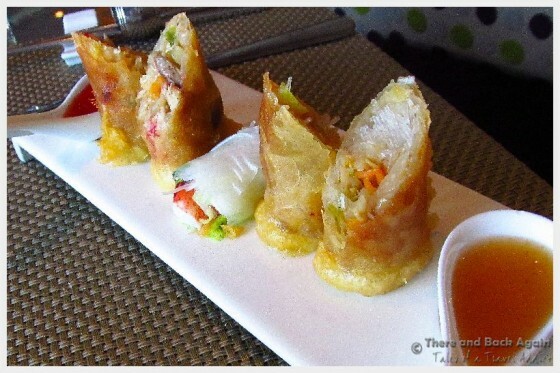 These are the first words that come into my mind when I think about dining in the Tamarind Restaurant on the Holland America Eurodam. Dining in the Tamarind is not just a meal but an experience to be savored next time you are on one of Holland America’s Signature Class ships! Our experience started with the presentation of warm towels and jasmine tea. 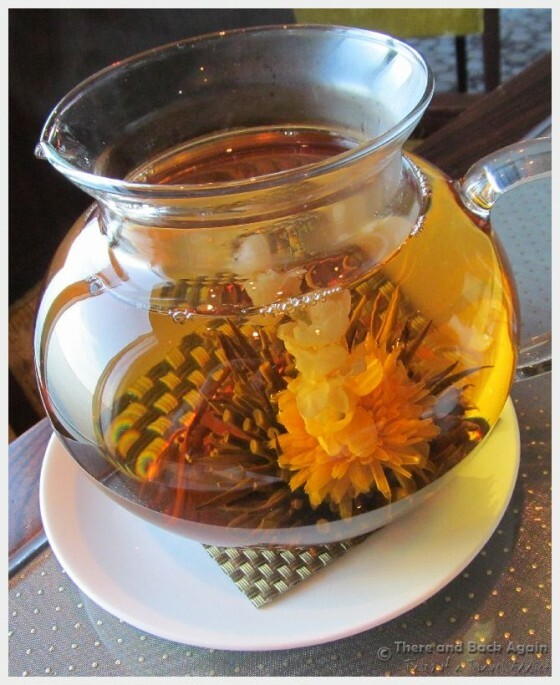 The jasmine flower floating serenely in the glass tea pot was a work of art. I could feel myself relaxing and allowing myself to be taken away to a different place. 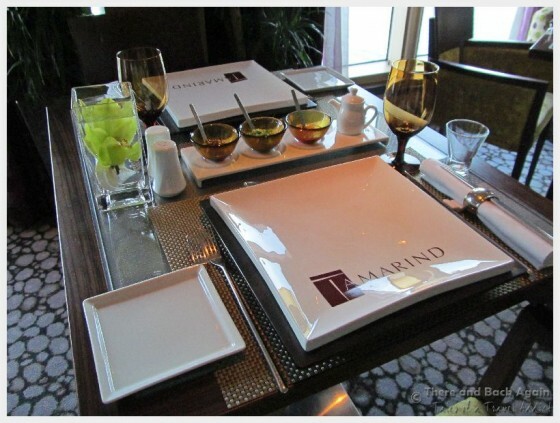 From the moment that we arrived, the service in the Tamarind was outstanding. The servers took the time to get to know us, to find out our names and where we have come from. They were extremely knowledgeable about the dishes and the countries where they come from. It felt like we had joined an exclusive club and for the remainder of our cruise, whenever we saw our servers from the Tamarind, they continued to greet us by name and inquire about our days. Our favorite dish from the first course was the Chicken Pho soup. It had rice noodles with coconut milk, lime and cilantro. 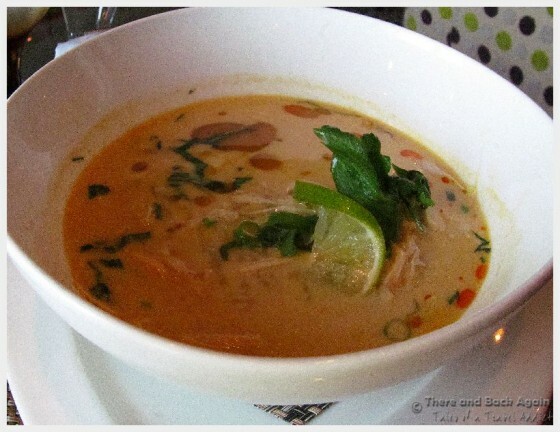 The flavors were vibrant and it reminded me a lot of some of the great soups that we ate while we were in Thailand. The imaginative trio of spring rolls that came next did a delicate dance of flavor and texture in my mouth. 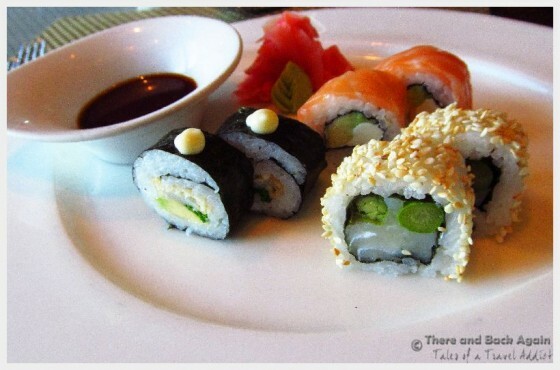 The sushi is made fresh in the restaurant and it was simple and well prepared with high quality ingredients. The selections of sushi were basic, beginner friendly selections of sushi, meant to be enjoyed by sushi aficionados and the uninitiated alike. 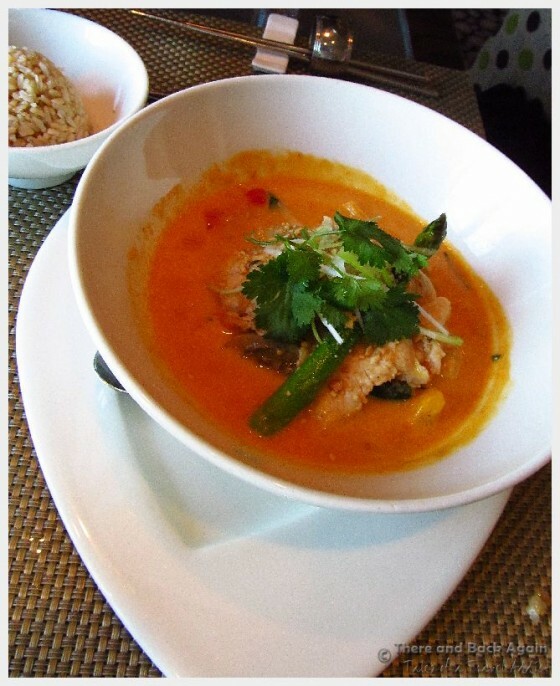 The Red Curry that I ate for my entree was flavorful but not spicy (I think it had been tamed down for European taste buds). I still very much enjoyed it, though if you are hoping for more spice, you might have to make a special request. I had a delightful little scoop of chocolate ice cream infused with chiles for dessert. I had heard of the chocolate/chile trend before, but had never really understood it until I felt the two flavors combine in my mouth. 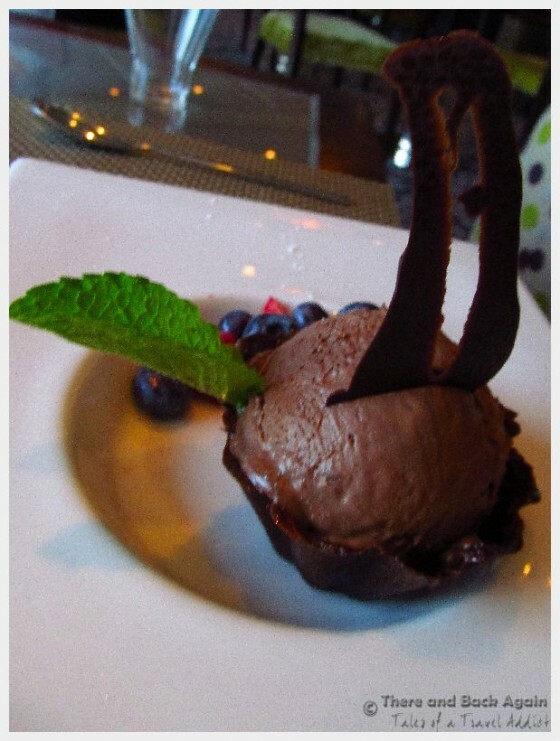 The cold, sweet flavor of the chocolate ice cream mingling with the warm, spicy flavor of the chiles is really just something that you have to experience in your own mouth! 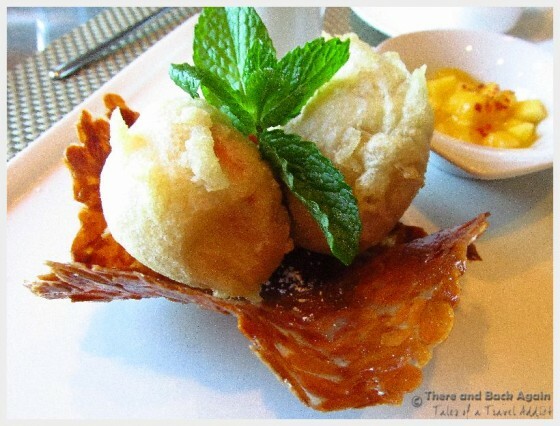 The Tamarind is a MUST if it is available on your next Holland America cruise…no “ifs”, “ands” or “buts” about it! 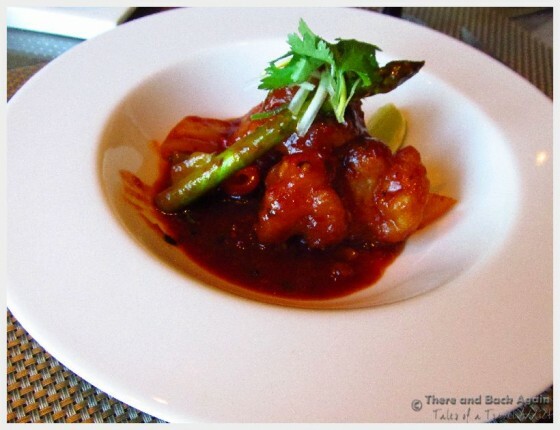 Holland America generously provided us with dinner for two in Tamarind. All thoughts and opinions are always my own. 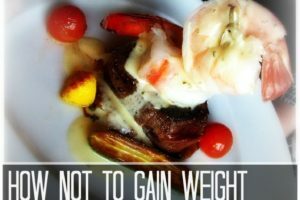 Looking for other cruise related content? 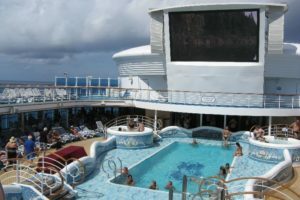 Here are some of my best cruise posts! 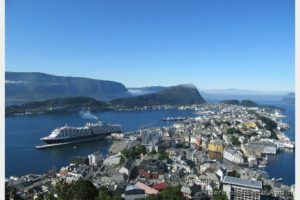 This was our first Holland America cruise, and we enjoyed it very much. Life on the ship was a change of pace from other cruise lines that we have been on, but the experience was relaxing and enjoyable and the food was AMAZING! Can’t wait to sail on another HAL ship soon!